MacDonald Highlands features five custom home neighborhoods with custom home sites that provide a variety of choices for buyers. Each neighborhood offers its own distinct topography and views. Buyers can choose from various terrains including golf frontage, multilevel pads or hillside elevations with views of DragonRidge, the mountain range, or commanding views of the Las Vegas skyline. Lairmont neighborhood is a twelve-acre enclave of golf course lots with only 16 custom-home sites within this neighborhood. Enclosed behind its own privacy gates, Lairmont’s custom-home sites front on private DragonRidge golf course. Elevated above the manicured golf course, the Lairmont neighborhood has been designed for single story, two-story, and multilevel estates. Prices start at $1,200,000. The neighborhood of Dragon Gate is an elevated ridge of only 12 hillside lots on one private street. From this heightened elevation one can see extraordinary views of the Las Vegas valley and its mountain ranges. The custom lots highlighted in this neighborhood have been designed for multi-level residences. The upper hillside will be left in its natural state to accommodate an architecture which blends into the hillsides and the lower hillside will be transformed into stepped lots for a more cascading home design. These custom-home sites range from 1/2 acre to 3/4 acre parcels. Prices start at $950,000. Glenbrook is a hidden canyon of majestic rock formations with 14 mountainous custom-home sites available. These home sites are some of the most secluded lots available within MacDonald Highlands. 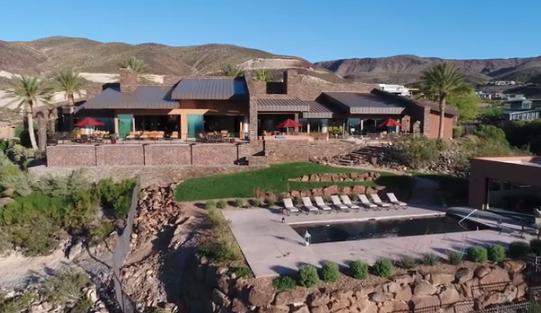 Sequestered behind its own privacy gates with an oasis themed entry, Glenbrook Canyon offers tremendous elevation changes for prospective buyers looking for that rare and unusual setting. Buyers can choose from mountaintop to hillside acreage with commanding views of the entire valley. These custom-home sites range from .99 acres to 1.76 acres and are priced starting at $1,100,000. The Palisades and Stone Mountain Ridge neighborhoods feature some of the highest elevations within MacDonald Highlands providing panoramic views of the Las Vegas valley. These mountaintop lots are perfect for terracing a multilevel estate and large enough to accommodate massive residences. The custom-home sites range from .86 acres to 2.24 acres. Pricing starts at $2,500,000. Don’t miss the opportunity to see these luxury homes for yourself. Call MacDonald Highlands today at 702-614-9100 or contact us on our website to learn more about Life at the Top.